Thank you for your tremendous support on yet another record-setting Tiger Athletics Give Day! 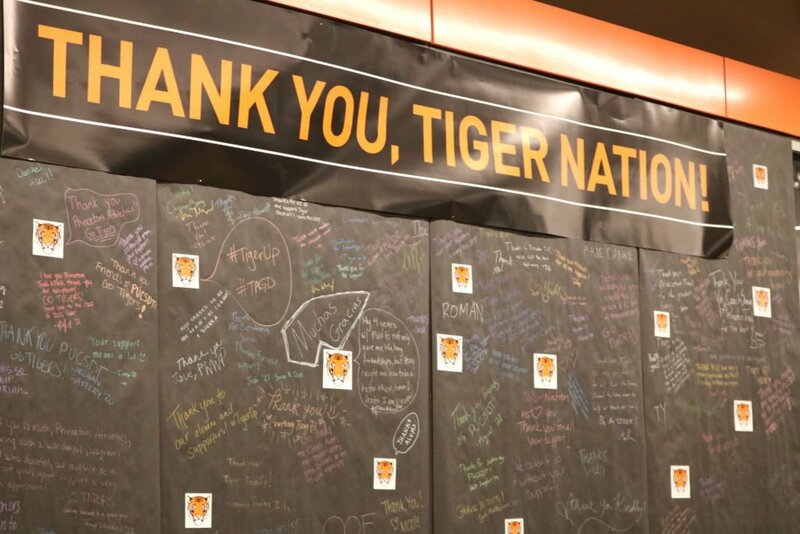 The fifth Tiger Athletics Give Day was a tremendous success, setting new records for dollars raised with $2,728,733 across 8,693 total donors. This brings the TAGD five-year total to $10 million raised from more than 40,000 gifts. The funds raised invest directly in programs that enable Princeton’s 1,000 student-athletes to “Achieve, Serve and Lead” at the highest levels and to provide those student-athletes the best possible undergraduate experience and holistic education. Additionally, the Princeton Varsity Club obtained 15 new Lifetime Members as part of TAGD, bringing the total number of PVC Lifetime Members to more than 250 since the program’s inception in 2010. These Lifetime Membership funds will be used to support a wide range of needs and opportunities for each of the 37 varsity teams and 1,000+ student-athletes, with all members now being recognized on the Lifetime Member donor plaque in the new Andrew J. Conner ’62 Lounge in Jadwin Lobby. Click here to view a feature on several of our top Tiger alums and their representation of the character of Princeton Athletics. In addition to the overall totals, several Friends’ groups earned bonus funds for beating their best and establishing new TAGD records. In all, eight Athletics Friends Groups set new highs for donors and/or dollars raised. The teams also competed in four brackets, based on the size of their Friends’ groups, for additional bonus funds. The winners for most dollars raised were swimming and diving, basketball, ice hockey and golf, while the winners for most donors were swimming and diving, baseball/softball, wrestling and volleyball. Rowing competed in its own bracket with a special donors challenge and won that with 1,972. Click here to view photos from Tiger Athletics Give Day. The day included three Twitter Live broadcast, the last two of which featured a series of games first between four head coaches – men’s lightweight rowing’s Marty Crotty, men’s hockey’s Ron Fogarty, women’s golf’s Erika DeSanty, softball’s Lisa Van Ackeren – and then a showdown between Crotty, the winner of those contests, and Marcoux Samaan, which ended with a win for the AD and an ice bucket dousing for Crotty. For more information on TAGD and to view the leaderboards, visit tagd.princeton.edu. If you did not have the chance to participate as part of the 24-hour challenge, you can still support Princeton Athletics by making a gift here.